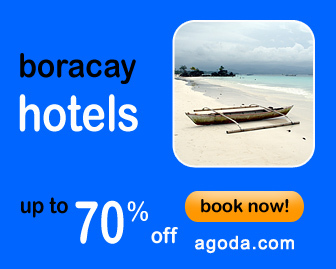 Do you want to experience something that is unforgettable when you visit Boracay? Parasailing might the answer to your question. Gliding in a parasail is one of best adventure rides in the island. It is perfect during sunsets but the ride is available starting 8am until late in the afternoon. Strapped in a seat covered by a colorful parachute, being on a parasail for about 15 minutes will surely give you a memorable experience. Seeing the pristine white sand of Bulabog Beach and the establishments of the main part of the island will surely give you a lasting memory. The long stretch of Bulabog Beach is full of “coordinators” who will bring you to Station 1 but you can always go directly to the companies who are selling the rides to avoid the extra charges. During peak season, prices go to as high as P2,300 for a solo ride and P1,700 per person for a tandem ride. During low season, they sell it at P1,000/person or even lower if you know how to haggle. The rates of the Parasailing already includes the 15 minutes of gliding, the boat transfer to your location, the parasailing equipment, life jacket and the speed boat that will pull the parachute. Parasailing is basically a parachute with a rope attached to the speedboat. The boat will maintain a speed to make the parachute stay in the air. Lowering the speed of the boat will make it fall and being too fast will possibly break the line. The line that holds the chute are regularly checked and maintained to avoid accidents. For those who love heights, it will be an effortless adventure – you can easily adjust after being suspended in the air for 1-2 minutes. For those who are afraid of heights, this is something that can possibly take your fear away. Just inform the assistants/boatman to gradually release the line so you can also adjust with the height and you get used to your situation after a few minutes. Prior to releasing you into the air, the coordinators will give a few instructions. You can either consume the full 15 minutes or choose to signal the boatman to pull the rope to get you down. Parasailing in Boracay is something that must be experienced in the island. The prices during peak season such as Holy Week and Christmas may not be reasonable but you do not have a choice during these days because the supply is low and the demand is too high. We suggest you go there during the off-season to avoid the rush and you will be accommodated almost instantly when you go to Station 1. A waiver will be signed prior to riding the speedboat and safety instructions will be given. After the parasailing, you can also try the Helmet Diving, ATV rides, Jet Ski and more. I had this experience as well but it was in Alegre! Close to your area. 🙂 Had to say it wasn’t all it’s cracked up to be (the parasailing I mean). Just sitting there and all. Great blog by the way.